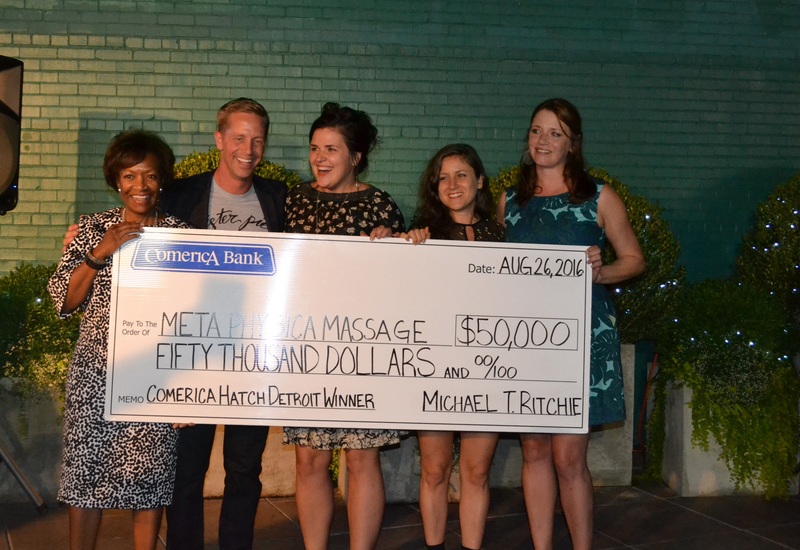 Meta Physica Massage & Sauna has won $50,000 from Comerica Bank in the 2016 Comerica Hatch Detroit Contest presented by Opportunity Detroit. The announcement was made this evening at the Hatch Off event in Downtown Detroit. Meta Physica Massage & Sauna will open a Wellness Center offering therapeutic bodywork, full spectrum infrared saunas, a raw juice bar, an herbal apothecary and health inspired retail, meditation classes and community workshops. In addition to winning $50,000 from Comerica Bank, Meta Physica Massage & Sauna will receive more than $200,000 in pro bono services including a $25,000 branding and design package from GTB (formally Team Detroit), a 30-second social media advertisement from MCCI, legal services from Honigman Miller Schwartz and Cohn, architectural renderings from Hamilton Anderson Associates and a package of accounting, IT, public relations support, and counsel from Hatch Detroit and its partners. Meta Physica Massage & Sauna rose to the top of the more than 150 entrepreneurs who entered the 2016 contest and were selected as one of the contests’ 10 semi-finalists. After 21,000 public votes were cast during the primary voting period, they advanced as one of the four finalists. The second round of public voting for the finalists closed at noon today and each finalist pitched their business idea live to a panel of judges and an audience of their peers during tonight’s Hatch Off event. The second round of public voting combined with jury deliberations crowned Meta Physica Massage & Sauna the winner of the sixth Comerica Hatch Detroit Contest presented by Opportunity Detroit. To learn more about Meta Physica Massage & Sauna, visit HatchDetroit.com.